Today was another one of those days when everything goes wrong. We wanted to run a mission towards the east side of West Lake Bonney. We switched to a new 2 km long fiber-optic cable to enable communications for this long mission. Vickie and Bill spent most of the morning spooling out the cable from into a box, and building a strain relief to connect the new cable to the bot. The strain relief reduces the tensile stress on the connector of the fiber-optic cable. I spent the morning organizing data from previous missions and writing scripts to copy, organize and backup data in the future. We started our mission around 2:00 in the afternoon. After a very efficient profile at the first grid point, we were starting to fell pretty optimistic about the mission. However, in the middle of profiling at the second grid point, about 420 m from the melt-hole, we suddenly lost communications with the bot. 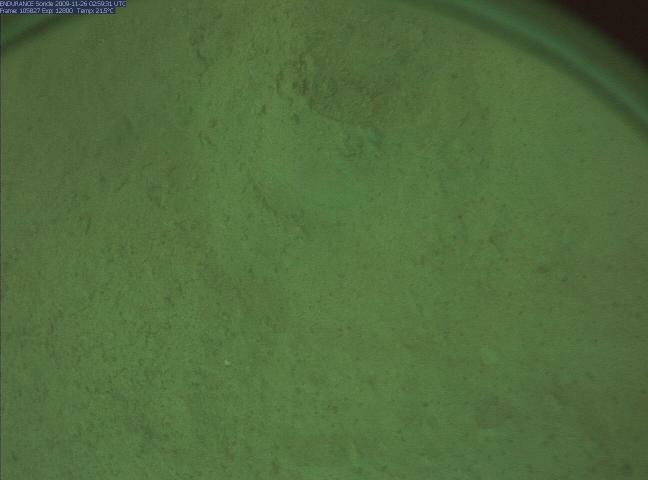 The science instrument package (profiler) was spooled down and was hanging about 25 m below the bot. As of this morning, the recovery script to bring the bot home in case of communication failure was still incomplete and we did not have that running. Fortunately, the bot was resting on the under-surface of the ice and was not executing any motion commands. The only option for recovering the bot was to slowly pull on the cable. The depth of the lake along the straight line from the bot’s location to the melt-hole was high enough to allow us to pull it back without running the profiler into the ground. It took us about 3.5 hours to pull the bot back. The first thing that came to our mind was that the problem had something to do with the new fiber-optic cable. After pulling the bot back, we found that the cable was working fine. Chris found out that he could not ping the router that talks to the main on-board computer. He thinks that the power supply in the main computer pod is flaky and caused the router to shut down. We will debug this problem further tomorrow. Chris tugs on the fibre-optic cable to pull the bot in as I measure the length of the cable pulled in. After pulling for about 3.5 hours, we recovered the bot and pulled it out of the melt-hole. 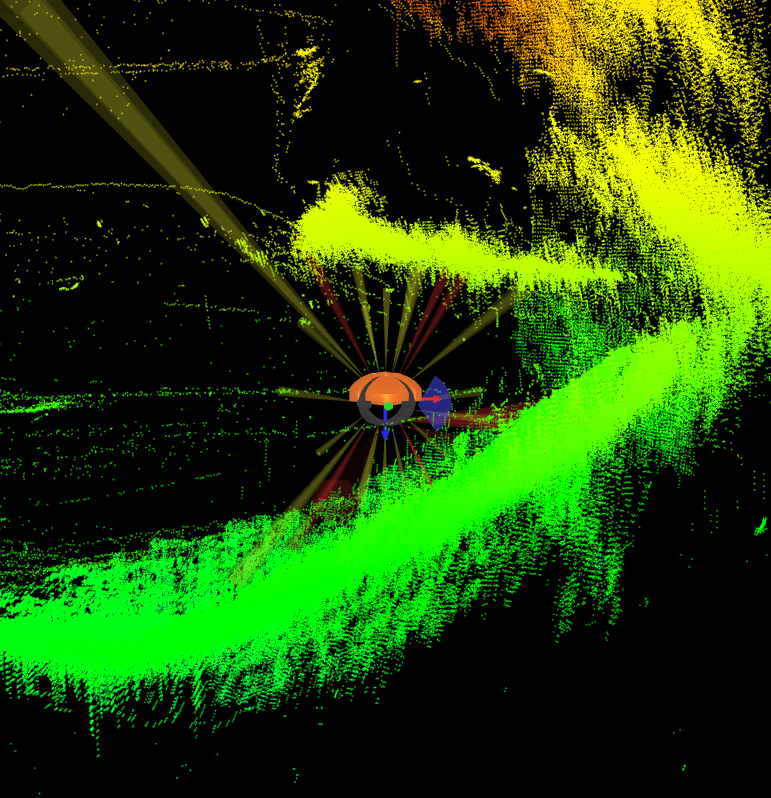 The profiler is hanging by the green cable about 25 m below the bot. We opened up the main computer pod to inspect the router and power supply. Chris and Bart inspecting the pod. The pod-cover is seen hanging from the gantry. The bot sees things in water! We had some more difficulties today. While going through the mission start checklist, I found that data from 3 of the 6 thrusters was being received only intermittently. Chris first thought that is was some problem with a driver card in the motor housing and we will have to open the motor pod to fix this. Bart decided to take a look at the screen-shot of the sensor state that we save at the beginning of every mission and realized that one battery had tripped off at night and did not get charged. This all took about an hour to figure out, and we all heaved a sigh of relief when we found that there was no major problem. We also found that the forward-looking housing had water in it. This was because a fault with the sealing O-ring. Bill, Bart and Vickie were able to fix this without too much difficulty. Kristof found that the forward-looking camera housing had water in it. Kristof and Bill inspecting the housing. We finally put the bot down the melt-hole and went on a mission. 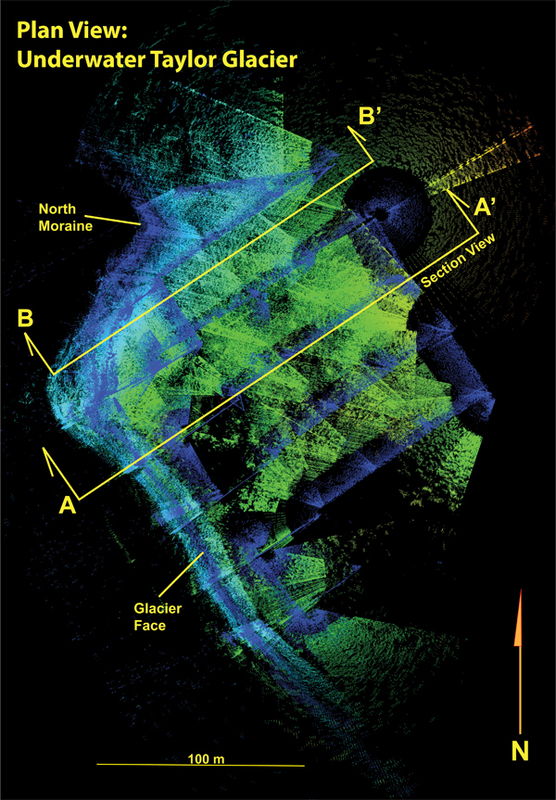 The objective of this missions was to figure out whether we could use a forward-mounted multi-beam sonar for detecting obstacles. 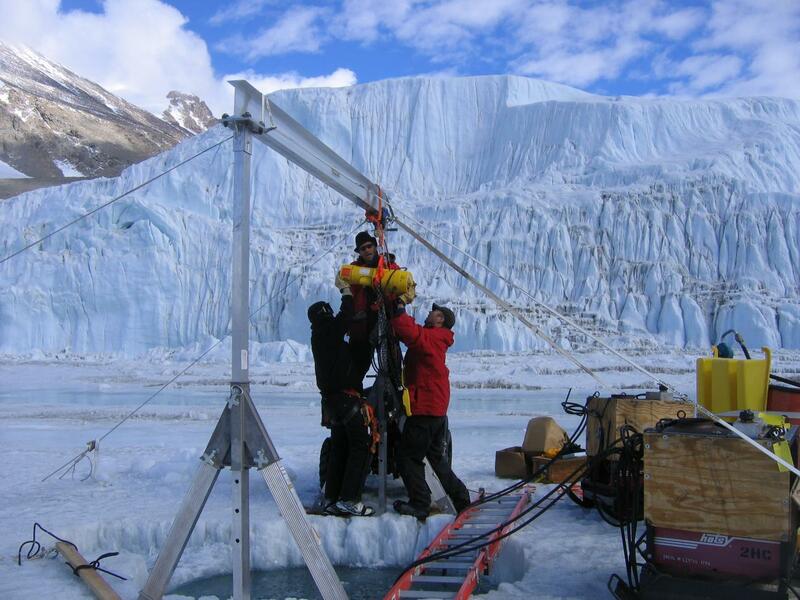 We hung three different obstacles from the melt-hole – an ice-chipper bar, a weight bag suspended from a cable and a PVC pipe. 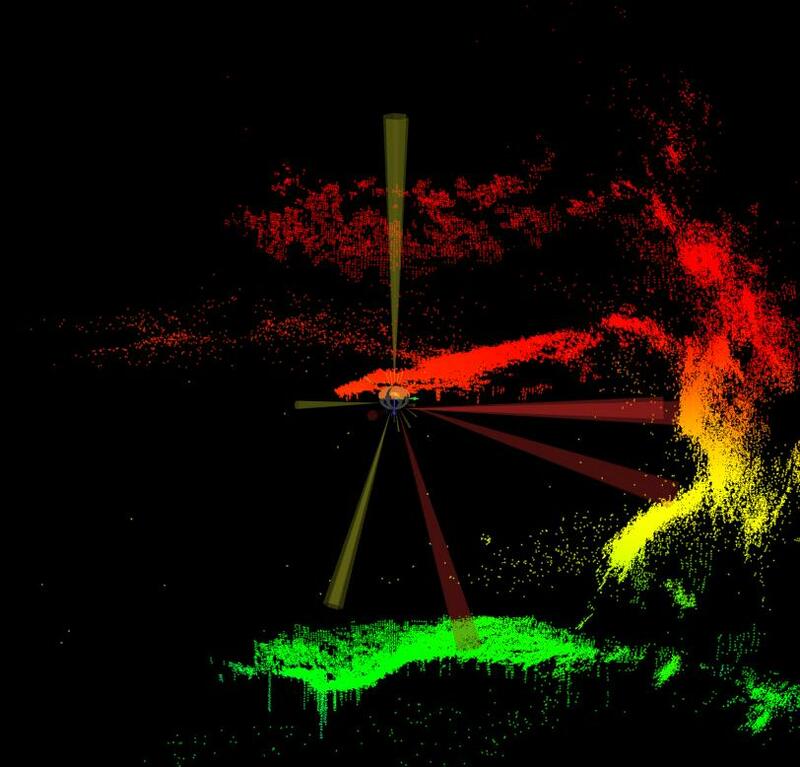 We were able to see all the three objects in the visualizer that was written by people at UIC visualization lab and built-upon by Chris. All in all, it turned out to be a useful day. 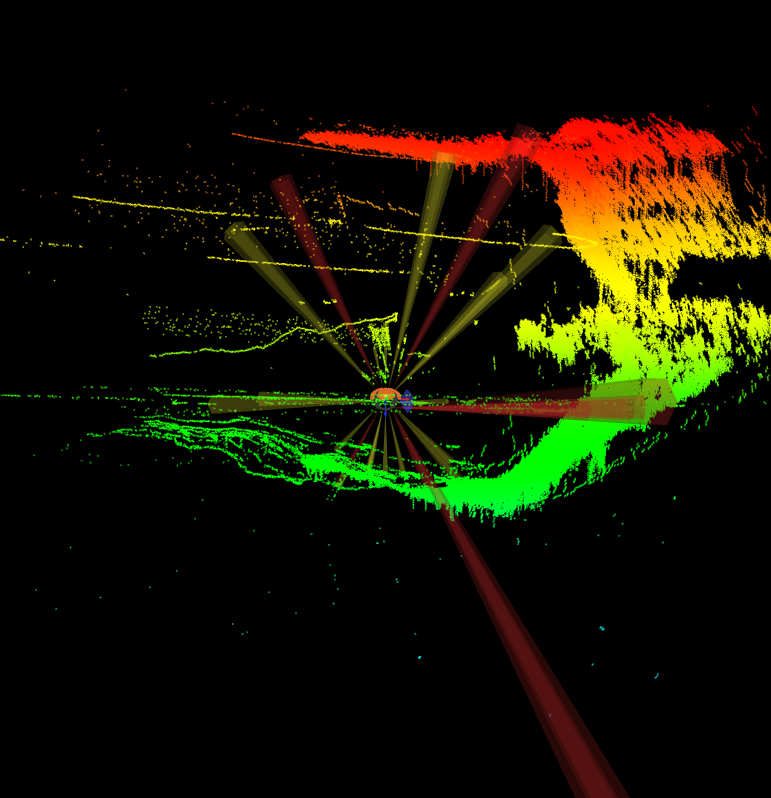 A screenshot of the visualizer that displays the returns from the forward looking vertical multi-beam sonar. 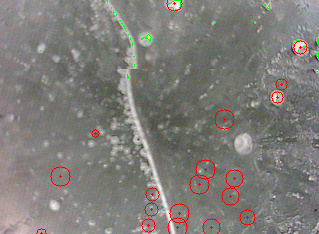 The dense red dots at the top are the ice surface of the lake. 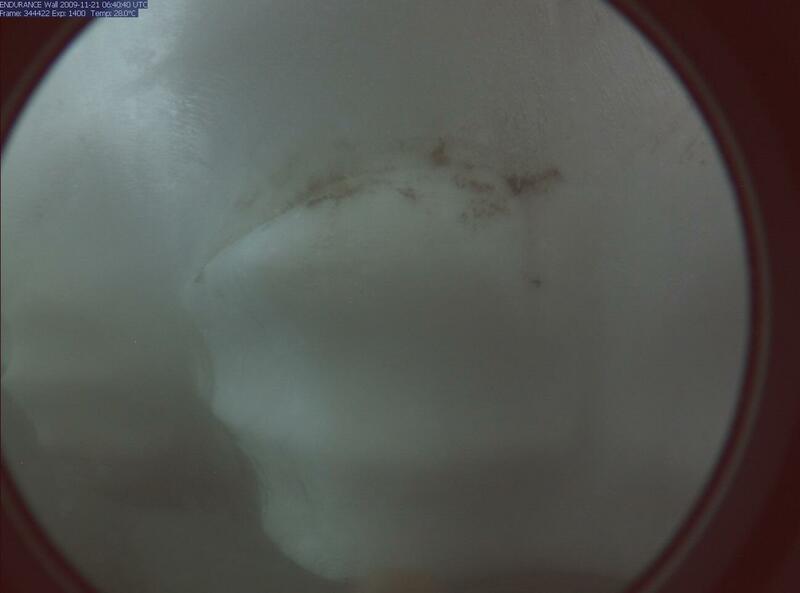 The objects that we suspended from the melt-hole are clearly visible. Photo courtesy Chris and Bill. 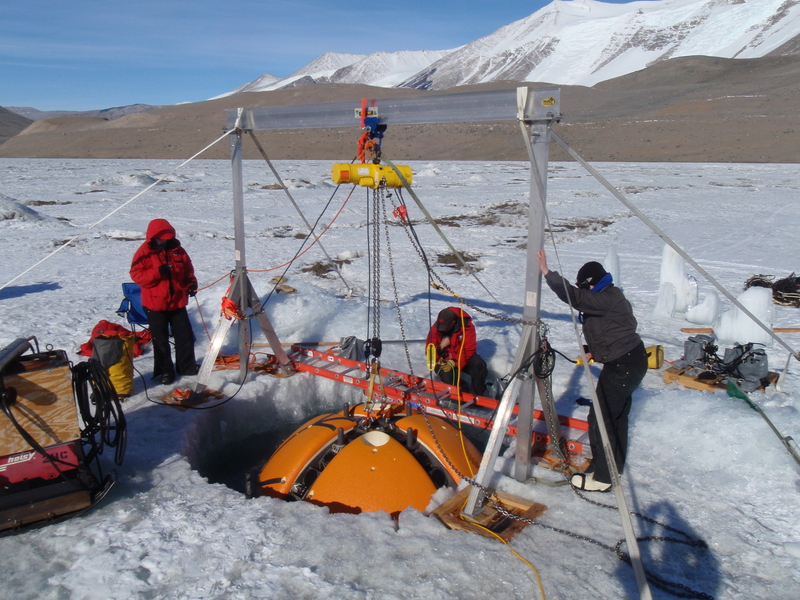 After many hiccups and delays, we finally got the vehicle to go down the melt-hole into the lake and performed preliminary navigation testing today. We had planned to do this in the morning, but the robot went down about 3 m down the melt-hole and got stuck. 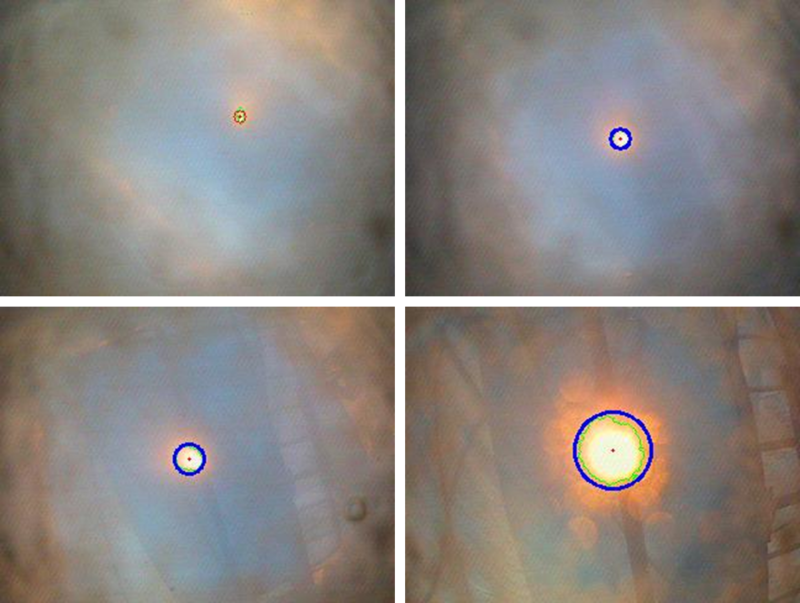 A fish-eye camera showed that the robot was sitting on an ice-ledge in the melt-hole. We managed to nudge the robot back up. Bill geared up and dived into the melt-hole and used an ice-axe to chip away the ice. Finally, in late evening, we were able to take the robot down the melt-hole into the lake and test our navigation systems. They all worked as expected. We will perform more exhaustive testing and instrument calibration runs tomorrow. Below are some photos from yesterday. Bill with a big chunk of ice that we melted after Vickie's input, from what she saw during her dive. Getting the melt-hole right has proven very difficult this year. We use a fiber-optic cable for communications between our mission-control computers in the bot-house and the robot's onboard computer. This year's exploration missions are longer than last year's. Hence, we bought a new fibre-optic cable. We had some connectors built for the cable by a guy at McMurdo. When the cable reached the bot-house yesterday, we foudn that it would not transmit light from end to the other. This was a big issue because this meant that the communications would not work. After using some diagnostic tool, we finally figures out that one connector was bad. This connector was removed and a new one made. 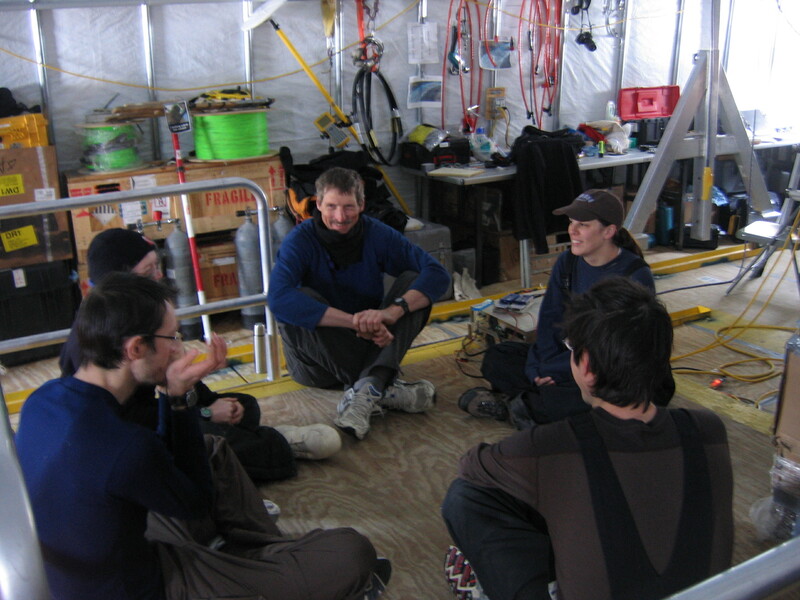 Bart, Kristof, and Chris along with the tech guy from McMurdo. Second dunk of robot with syntactic foam on. The bouyancy is adjusted manually so that it is neutrally bouyancy by adding/removing small lead weights. Kristof was using a makeshift wooden log to hook and unhook the bot from the gantry and got a large splinter from it in his hand. Bart helped him get it out. We performed the first dunk test of the robot yesterday. This is done by just hanging the bot in water from a crane. The flotation “syntactic foam” is not put on. The aim is to check for leaks in hardware, and make sure the entire system works in water. Melting the hole took way longer than we expected. The day began by the hole frozen over with ice. Rest of the story in pictures below. The melt-hole was frozen over with ice. Jim first broke the ice with an ice-axe. After breaking the ice, we put the heating coils in water to melt the walls of the hole. Kristof spent almost the entire day tending and moving the coils to get a smooth sided circular melt-hole. I felt much better and was able to work all day, though still far from 100%. The bot being dunked into water. Bart observing the bot. 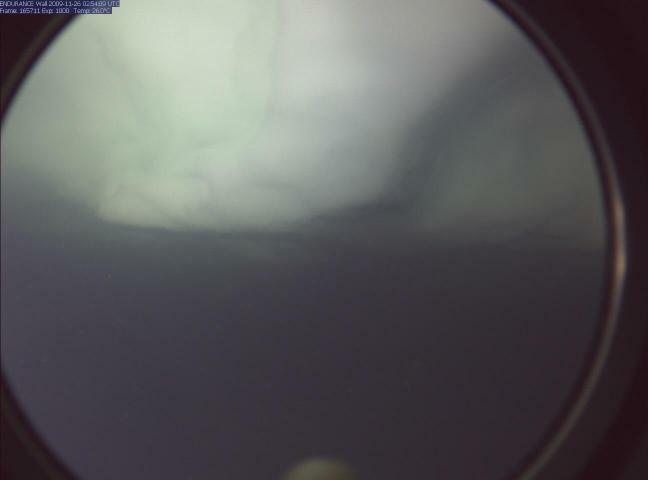 There were no leaks and the profiler worked as expected, except that we could not get images from the sonde camera. Chris and Kristof chooping off ice for water at the end of the day.